Until now, we had the high-quality press renders of the Moto E5 and Moto E5 Plus which showed the design from every angle. Recently, we came to know that Motorola is going to announce the E series phones alongside the G6 series which is quite interesting. We know some of the specs like 18:9 displays and single rear cameras on both the E5 and E5 Plus but still, there was no reliable information about the processors powering both the devices. Well, the FCC listing of both the phones has now revealed information about the processors. It is a good thing to know that there is no MediaTek processor powering any of the two phones. As mentioned in the image above, the Moto E5 Plus is powered by the Qualcomm MSM8937 or the Snapdragon 430 processor along with Adreno 505 GPU. It is an octa-core processor (8x ARM Cortex A53) with up to 1.4GHz CPU clock speed. It is based on the 28nm manufacturing process so it isn’t as power efficient as the 14nm Snapdragon 450 processor. Talking about the Moto E5, it is powered by the Qualcomm MSM8917 or Snapdragon 425 processor along with the Adreno 308 GPU. It is a quad-core processor (4x ARM Cortex A53) with a clock speed up to 1.4GHz. Well, with these processors, the E5 and E5 Plus are surely not going to be the best budget phones in their price segment. We already have some Xiaomi device with Snapdragon 435 (Redmi Note 5A, Redmi 4X) and Snapdragon 450 (Redmi 5) at the same price at which the E5 and E5 Plus are expected to be launched. Let’s see if other specifications like the OS, camera, battery, etc. can make these phones better than the competition. 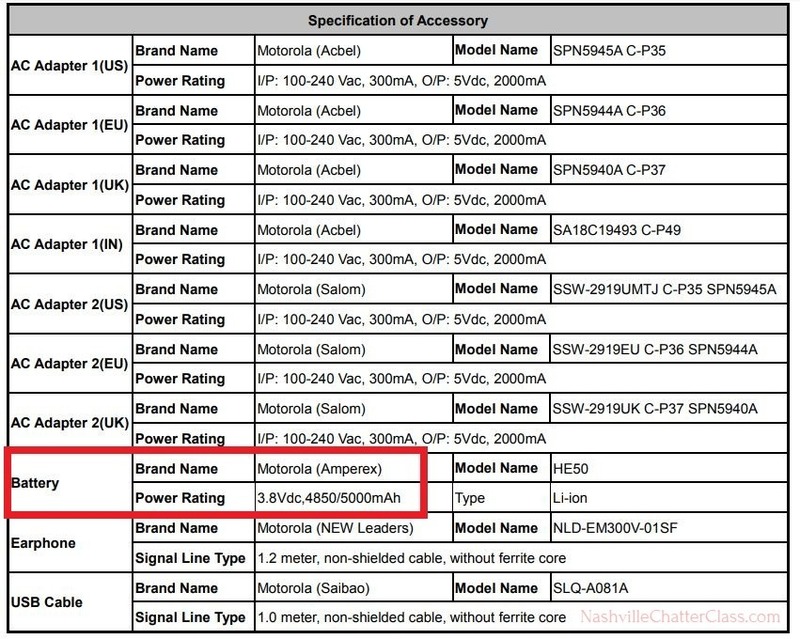 Finally, the FCC listing also revealed the battery size of the E5 Plus. Just like last year’s E4 Plus, the Moto E5 Plus has a huge 5,000mAh battery under the hood with TurboCharging support.